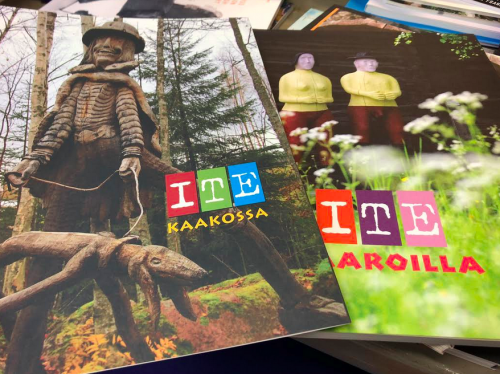 ITE in Finland translates literally as self-made life. 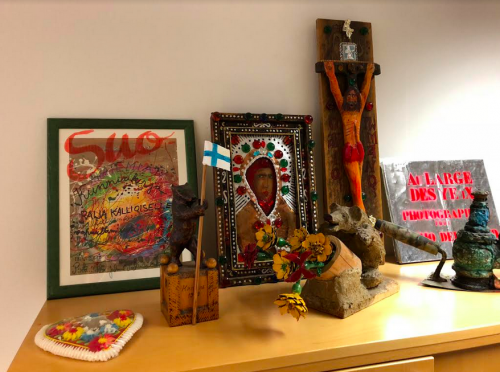 We met with Raija Kallioinen and Minna Havera from the ITE organisation that stated amongst other things they specialised in contemporary Folk Art within Finland – with several examples of it dotted across the offices. Starting life 20 years ago, they have grown the number of artists that they have had contact with. Several of the artists are now proud to say that they are ITE artists as opposed to being seen as the village clown by their neighbors for their creations. In Finland, the artists and makers are often working in isolation due to how rural the country is. So ITE put out ‘wanted’ posters, in a particular region that they have funding for, in cafes, museums, libraries and through the internet and social media, asking people if they know of anyone creating anything unusual. From the following phone calls and emails received, a team of field workers go out into the region to document, photograph, interview and create videos of the artist or maker that has been suggested. These then form the basis of group exhibitions and of a book – ITE create one book a year that documents all the artists that they have met across the year, their work and their biographies. Within the exhibition, the curator chooses to exhibit the work like a mini-environment, so it replicates the way the artist may have built the environment/creations out in the world. Found objects and wood feature heavily within the artist’s work that are creating in the more rural settings. Within the city-type regions, the works have a very different look and feel, as materials are more readily available. One collector from Switzerland who buys and promotes the work, travels every year to Finland in October to meet with the artists he has bought for his collection. A personal touch like this means so much to the artists, and we hope more collectors want to have more involvement or be kept up-to-date with any progress or changes that artists may make. We were also excited to hear about their Bear Festival that has just been held for the fifth consecutive year. Artists working with a chainsaw are invited to carve bears into blocks of wood that become artworks across the city, and to-date there are over 1,000 sculptures across the city, that help to make it a more desirable place to visit! In contrast, Culture For All promotes cultural services that are inclusive and take diverse audiences into account. Since 1999 the organisation has offered information and tools for workers in the cultural field to improve accessibility and knowledge of diversity. Firstly it was with access and disability related issues, and now their work has a wider remit than this. We were due to meet in Finland, but due to travel delays this didn’t take place. 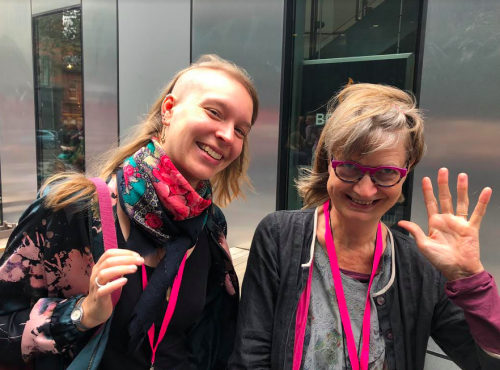 Jennifer caught up with Outi and Sari at the Unlimited Symposium in London shortly after though. Here they are giving a wave! 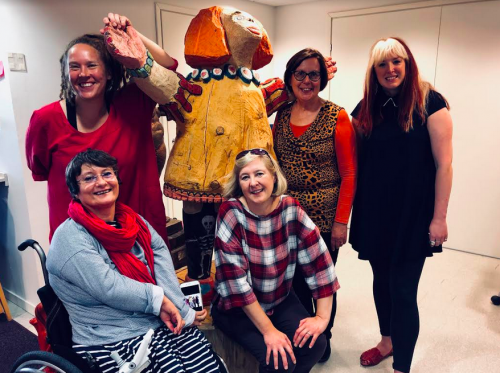 These blogs are co-written by the producer for this research project, Jennifer Gilbert, and Director of ArtStudio01, Tanya Raabe-Webber, sharing what they have learnt during their studio visits.